I have tried to write this several times now. It’s hard only because there is so much to say, and I am not sure how to say it in a cohesive, intelligent manner. If I run all over the place, you’ve been warned. Hell, if you know me, you’re probably pretty used to it. Toward the beginning of 2013, I found this group called Random Acts. This guy I followed on Twitter named Misha posted about it. If you watch Supernatural, he’s the angel dude. You know, the one that when you try to impersonate him you sound like Bale’s Batman? Yeah. That guy. So anyway, he posts this tweet about this thing called AMOK. Immediately, I start bouncing around like Sara Jessica Parker in Hocus Pocus. If you don’t understand my reference, please get off my blog right now and go educate yourself. I DIGRESS! He posts about AMOK, so I follow the link, because I was mildly entertained. I sat there staring at the page for a while. I thought the concept was perfectly amazing, but when I tried to think of what I would do, nothing came to me. I didn’t want to do something small, but knew I didn’t have the funds to do anything completely grand. I can tell you, I didn’t stop thinking about this for the weeks leading up to the day of the event. That day came, and still I had absolutely nothing. That weekend I was down with my sister in the Springs and we were just wandering about really. We walked around most of the day, myself still frustratingly idea-less and this went on until we were leaving the grocery store. Out in the parking lot there was a nicely dressed woman with a little boy in her arms. She was standing next to her car, which was more or less just a normal sedan, looking a little frazzled. I need to pause the story here for a minute to explain something. I am not friendly. Everyone argues this point, and that’s because they are already my friends. Seriously though, I am not. I don’t talk to people I don’t know unless I am forced or they’re a friend of a friend or something along those lines. Human beings terrify me. BACK TO THE STORY! This woman is there, by her average car, in her nice clothes, clutching her little boy looking frazzled. I saw her, and before I knew what was happening I asked her if there was anything wrong. The woman just stared at me for a moment, then told me that I was the first person to ask her anything like that. She went on to explain that she was driving through town coming home from a funeral and that her wallet was stolen or lost wherever she was before. Since this was on a Sunday there was no way for her to get to a bank to explain her plea, and no way for anyone to wire her any money until the following day. The woman assured me that her husband would be sending some funds then so they could get home all safe and sound, but in the meantime, they were staying in the car because the hotel they had planned on staying in on their way home was unsympathetic to her problem. We did not stay and talk long at all. Once again, I don’t really know how to deal with folks I don’t know. Before we left though, I recalled that I had taken some cash out, and there was a cheap hotel exceptionally close. By the time she had finished telling her story I had my wallet out and was handing her the money. She gawked at me a moment before accepting, which I am convinced she ultimately did because of her son. Thanking me profusely, we parted ways, both of us with huge smiles on my face. It was at that point when the name Random Acts made sense to me. Clearly I had known what it meant before, I am not an imbecile, but like River said ‘she understands, but she does not comprehend.’ I knew what Random Acts meant going in to it, but I really, truly, genuinely… didn’t. And that’s the starting point that takes me to the now. Since that day in March I haven’t been the same. Hope to Haiti happened. I am still beyond heartbroken that I wasn’t able to go meet the children and work on the center with my own hands, but some marvelous folks went instead, and I know in my heart that there will be other adventures. In the meantime, despite not going, I raised a decent amount of money for a wonderful cause, and met so many fantastic people. People that I cannot express what they mean to me, mostly because it baffles me. Not in a ‘why are they important’ kind of way, but in a ‘how can I feel such a connection to someone I have never met’ kind of way. In the hope of avoiding sounding stalkerish, I want to tell you a little bit about these folks, because damnit, the world just needs to know. There’s Rea. Rea was the first person I talked to throughout this crazy whirlwind of what are my feels towards Random Acts. Rea had raised her 5K to go on the trip to work on the center, but she needed a little bit more to travel so she set up a personal page to help travel costs. I shared this on a whim, because I wanted to help her out, so she thanked me, we started following each other, and since that point every conversation fills me with a warm kind of joy. Everything she says is genuine, and kind, and I am so thankful to know her. Shelley’s from Australia, and she makes chainmail too! She’s a timelord, but her iTunes hates her. Because she is a timelord, she has two hearts, and let me tell you, they’re both HUGE! Last but certainly not least is Erin. We’ve been talking a lot lately. She’s a little shy, but has a huge heart, and I am very blessed to have met her, just like the others, throughout all of these wonderful missions. Random Acts has filled my heart with so much. Filled it to the point that it’s stretched and it now requires so much more to fill it. Now we’re moving in to the mission of Endure for Kindness (you can find the links to the other folk’s fundraisers as well). My wonderful team and I will be baking for 24 hours and taking the bread to those in need around our community. For those of you being inundated, I hope this post helps you understand a little bit. I am excruciatingly awful at keeping up with this. Let me touch on a few events of the summer. First, my sister lost her home in the Black Forest Fire here in Colorado. Many people came forward and helped us dig through the ashes, and help them financially. It was quite inspiring to see. Even saved a couple relationships that I had thought completely doomed, because sometimes, there are just things that are more damn important than petty grudges. Anyway, they are now mostly back on their feet, and just received orders to Japan. That will be something I touch on in a future blog, because there’s just too much emotion there to handle it now. Due to my sister losing her home, I was also running our chainmail booth at the Renaissance Festival. Thankfully I had a lot of help from a wonderful team of folks, but that ate up a ton of my time with making pieces and trying to keep the parts that I was responsible for running smoothly. Along with both of those major situations going on, I got a new job. Said new job has been the best I have ever had, and I truly count my blessings every day. I am now working with a small software company in the automotive industry. I am in their IT department, and as of late I have also been working with billing, setting up new accounts. Never have I worked for a better company, and I very much look forward to spending my career with them. Now, with all those excuses out of the way, I am really going to try and keep up with this more. Not only to keep in touch with my out of town folks, but because of the crazy events that I take part in that just take up too much of my heart to stay inside. That video illustrates one of them. Back in March many of you came forward to help me raise money for this amazing cause. Together, we raised $660 for these kids and this cause as a whole. When I saw that video above, I couldn’t stop the tears. Magic was made for those kids, and in a small way, we were a part of that. I can’t think of anything better I could possibly do with my life. There was also the phychotic-ness that was GISHWHES (The greatest international scavenger hunt the world has ever seen). 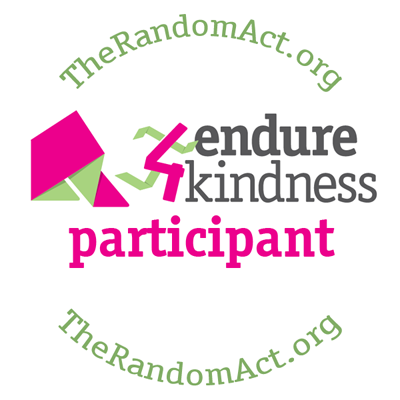 Though not directly involved with Random Acts, it is put on by Misha Collins, and we do work in conjunction with RA each year for certain submissions. This year we helped fill a home that was being built for some folks that luck just hasn’t liked as of late. 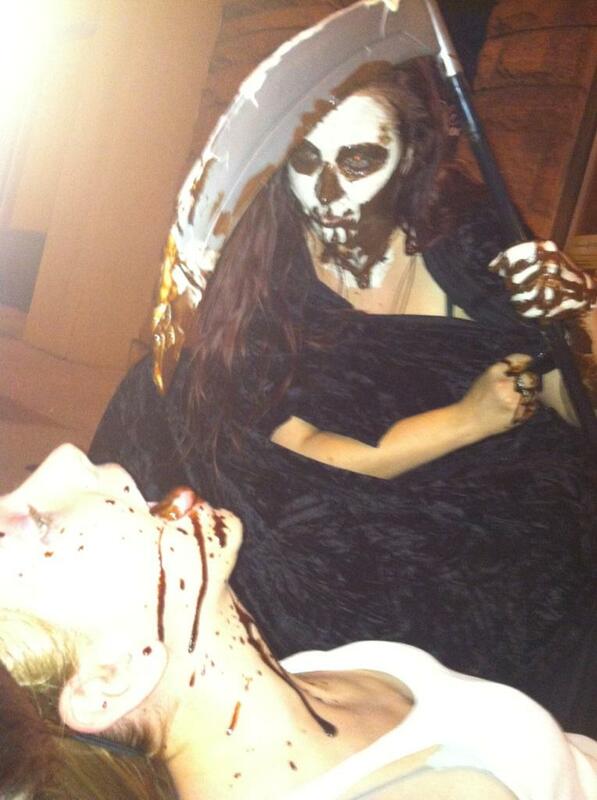 Throughout this event we spread joy, kindness, and killed the crap out of normal. Here, have some pictures! One of the submissions was to do something you’ve always wanted. 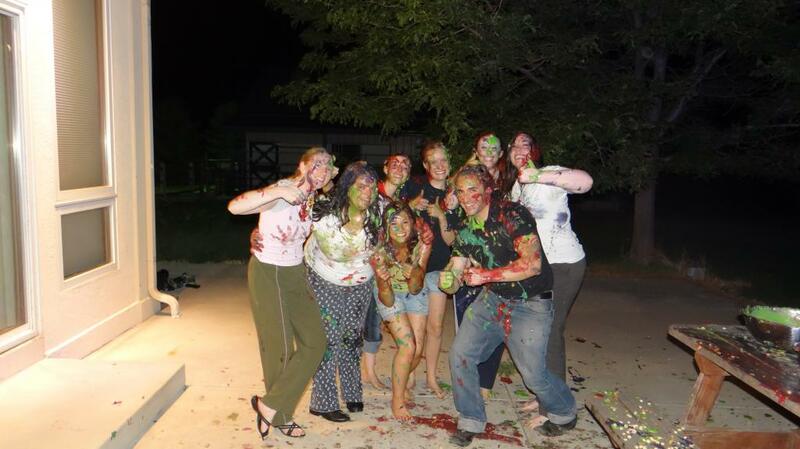 So we had a food fight. This is the aftermath. I still have acne from this. Yes. 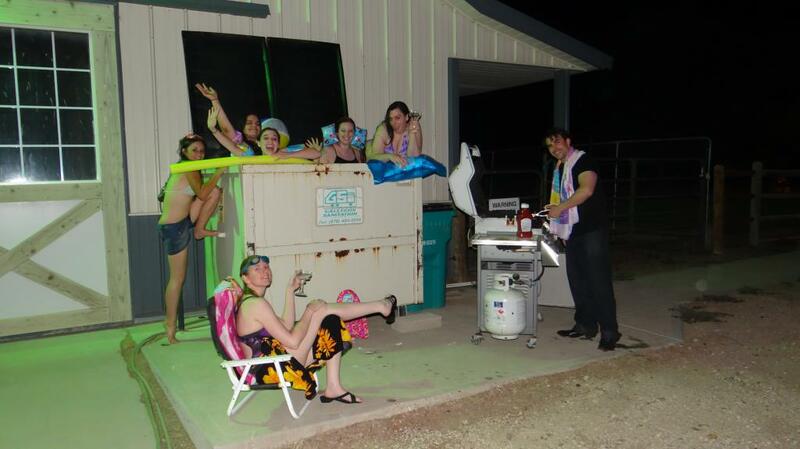 That is us in a dumpster. Yes. It was gross. It also gave me the biggest bruise of my life. For more of these shenanigans, you can see my album on Facebook. Now we are moving in to a whole new event. Endure 4 Kindness. Myself and some of that crazy bunch of folks you see above will be baking for as long as we possibly can and then taking all of the goods to those in need. I will be giving more updates on that mission as we get closer to it. In the mean time, we are moving in to a new apartment, and we have a show coming up shortly as well! Speaking of all of that, I need to hop back to packing. I promise not to stay gone for too long this time!